The UK-based Palestinian singer discusses how her music is part of a struggle for Palestinian identity. 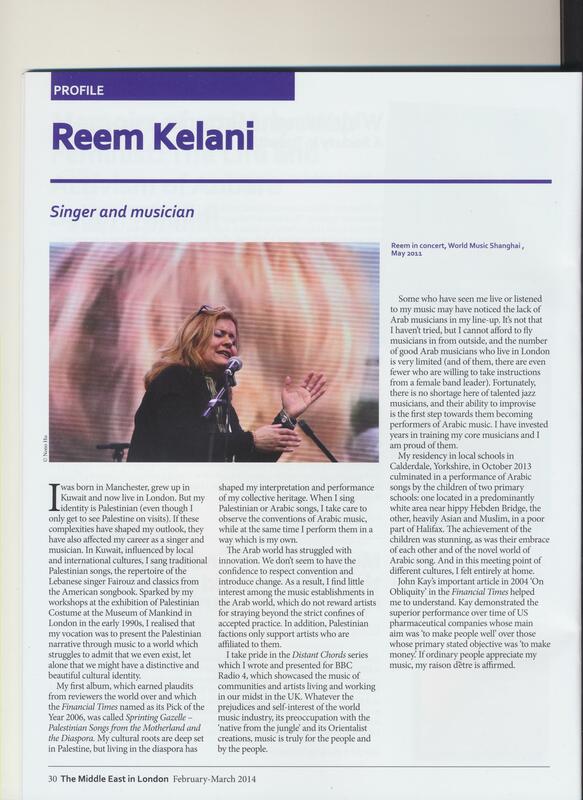 Acclaimed Palestinian singer, Reem Kelani, talks to Palestine News about her life and work. Palestinian singer Reem Kelani indulges herself in research on iconic Egyptian music legend, Sayyid Darwish. 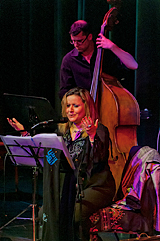 Reem Kelani: 'You can burn a book, you can burn a piece of antique furniture, but our music, our songs, our poetry, you can�t burn; it travels, it goes everywhere'. I was born in Manchester, of Palestinian, Arab, Muslim parents. This is my story in the Long Now. My mother hails from Nazareth in the Galilee and my father from Jenin in the West Bank. I spent my formative years in Kuwait and I moved back to the UK 20 years ago. I see myself not as a victim, for victims can become oppressors. I have my Palestinian cultural DNA, and as an artist, I want to share it with you. There are people who seek to suppress my narrative, while others are afraid to acknowledge it. My debut solo album took 20 years to produce, encompassing my arrangements of old songs I collected from Palestinian mamas in Palestine and in the refugee camps in the region, as well as my own compositions. It wasn't an easy journey, but as an independent unsigned artist, I take pride in bringing my cultural heritage to you. 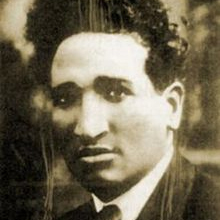 I just want you to acknowledge my existence as a Palestinian and our rights as Palestinians. You may not like my music, but you cannot ignore the collective cultural heritage of my people. I had the privilege earlier this year to attend a talk given by Archbishop Tutu, in which he spoke about the struggle against Apartheid and of how the Church of England had sustained and supported him and his colleagues in South Africa through solidarity in their hour of need. Similarly, the Church of Denmark responded to the threat of Nazism and did so much to ensure the safety of their Jewish fellow citizens. May Palestinians, and Palestinian Christians among us, not have to wait any longer for Christians in Europe to take up their struggle for basic justice. After all, St George, your patron saint, was a Palestinian! Fancy cutting your own CD? 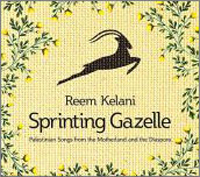 Singer Reem Kelani became an entrepreneur to make sure her music was heard. 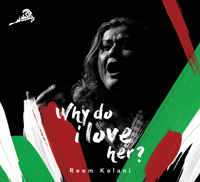 Singer Reem Kelani is not affiliated with any political association or movement, but she can't help who she is. "It's true - the fact that I exist, that I am here, makes me political. You can't be a Palestinian without being political", Kelani said recently. Yet she won't talk politics in concert. 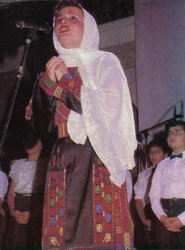 Instead, she tell stories and jokes and takes time to explain the meaning of her songs to non-Arab audiences. Though Kelani, 31, was born in Manchester, England, and earned a degree in zoology there, she has lived most of her life in Kuwait. She left Kuwait and returned to England nine months before the outbreak of the Gulf War. 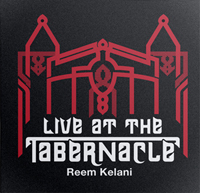 Last year, for the first time, Kelani gave concerts in Palestinian camps and the Israeli-occupied territories. "There were mixed feelings. I was happy. I was appalled. I was sad. I was elated. I was depressed. I was manic", she admitted. "We are 2.5 million Palestinians who live outside Palestine and it is difficult. You don't have the day-to-day danger of living under occupation, but you have nostalgia and estrangement". On tour, Kelani expresses her nostalgia through the choice of her material and her musical gestures of blues and jazz. Whenever possible, she lives to draw cultural parallels too, and will happily sing an Irish ditty for an Irish crowd or an a capella version of Amazing Grace for an audience in Scotland. Concerts will often include a Gershwin or Berlin standard. For tonight's performance at Place des Arts, however, Kelani will concentrate mostly on her Palestinian folkloric repertoire. She will accompany herself on acoustic guitar and wooden flute, joined by a derbakkeh drummer and a second musician on the lute-like oud. When asked whether Kelani expects to live in Palestine one day, she hesitated. "That's a tough question. We have an old Arab saying: 'When there isn't what you want, want what there is.'"